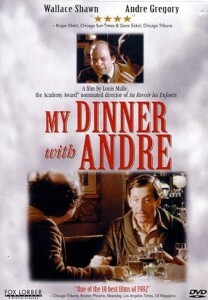 From Wiki: My Dinner with Andre is a 1981 movie starring Andre Gregory and Wallace Shawn, written by Gregory and Shawn, and directed by Louis Malle. George Wu review "Wallace Shawn and André Gregory began keeping records of their conversations over a period of months. They then turned it into a screenplay and enlisted Louis Malle to direct. The "story" is incredibly simple"